Whether you are taking a new drug to market or are already there, PAREXEL® has the most comprehensive worldwide regulatory expertise and experience. In fact, senior industry experts in our Regulatory Outsourcing Services group have an average of 14 years of life sciences experience and are active in industry work groups like HL7, DIA, RAPS, TOPRA, and IRISS. This team of regulatory experts – including many former regulatory officials – can guide you through every step of the submission process, ensuring that the submission strategy not only supports the timely delivery of the initial application, but is also optimized to reinforce efficient maintenance of the submission lifecycle beyond approval. Our expertise and technologies also empower PAREXEL to identify new opportunities, anticipate complications, manage your regulatory information, protect you from theft and counterfeiting, and keep you prepared for localized variables worldwide, including audits and inspections. 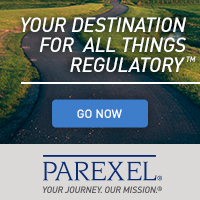 PAREXEL’s regulatory services help you grow and protect you, your products, and your stakeholders. Learn about our Strategic Compliance & Risk Management expertise.